this photo needs a caption, but i got nothin'. what do you think is going on in that little noggin o' his? i bet he's thinking about how much he loves him some top baby blog votes. yup. 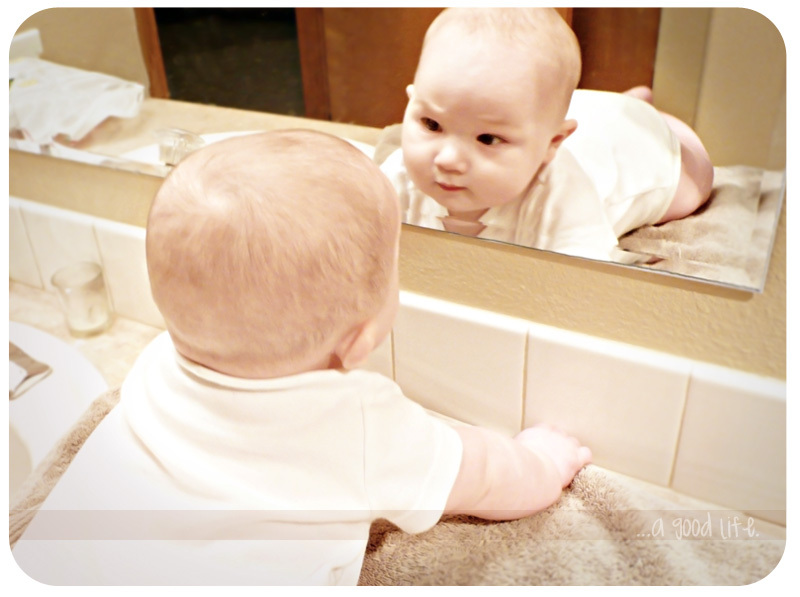 He's thinking, "Hey Mom, who's the cute kid in the mirror????" I immediately thought, "Who you lookin' at???" OMG SO CUTE!! Hes thinking "Look at that handsome guy"
hello handsome...you come here often? He's thinking, "Well hey there, handsome!" He's thinking..."MOVE! I dare you!" And he secretly has a gun in his onsie. Watch out mom, you could be next! Hey, I've got a twin! :) Great shot! He's already posing for the ladies! Nice shot!